Revenue Buckets allow you to break down and understand the financial makeup related to the different elements to your deals. These could be as simple as Product and Service, or a much more complex configuration factoring in pricing structures such as recurring revenue etc. Revenue buckets also help when reporting and forecasting. By splitting out the Total value of your deals into different categories you can quickly gather a high-level overview on the performance of your revenue. Product A, B, C etc. To configure your revenue buckets go to App Settings > Deals & Forecasts > Revenue Buckets. Click New Revenue Bucket in the top right corner. Add the name of the Revenue Bucket you wish to create. 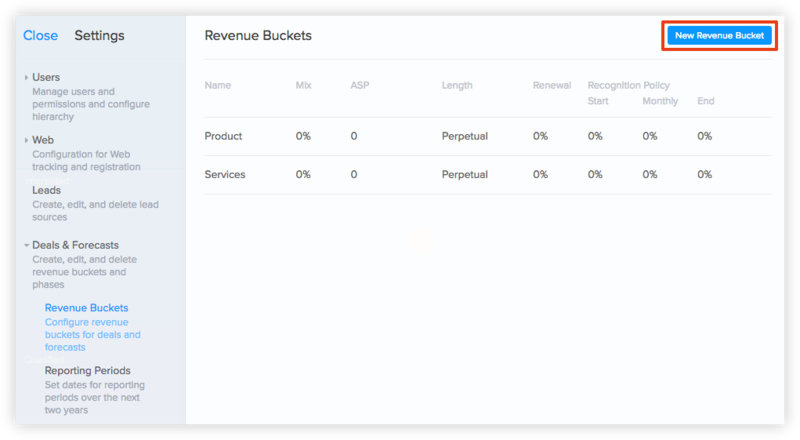 Your revenue bucket will now show in the overview. Once the bucket has been added you can configure the bucket settings by hovering over each value and clicking the edit button next to it. Question: How many Revenue Buckets can I create? Answer: You can create as many different revenue Buckets as you require. Question: Will all other users be able to see the Revenue Buckets? Answer: Yes, Revenue Buckets are visible to all users in the system. Question: Can I change a Revenue Bucket later? Answer: Yes, you can change the title and any of the values. Please note that if you delete a Revenue Bucket all the data on the deals records will be lost. This includes data that you added to historic records. Question: What do the values 'Mix', 'ASP', 'Length' etc mean? Mix = Typical percentage breakdown in a standard deal. Renewal = The percentage likelihood of a deal renewal.